I met with Apple after its WWDC keynote today to get one of the new Retina display MacBook Pro notebooks. I thought I’d give a quick rundown on some of the features and my thoughts before posting a more in-depth review. Obviously the first thing you’ll notice about this notebook is the display. It’s absolutely gorgeous. What’s interesting is that the display preferences are all about its Retina capabilities. For instance, my MacBook Air lists the resolution available for my display as numbers like 1440 x 900, 1280 x 800 etc. On the Retina MacBook, the preferences show Best (Retina) and scales up to More Space, or down to Larger Text. 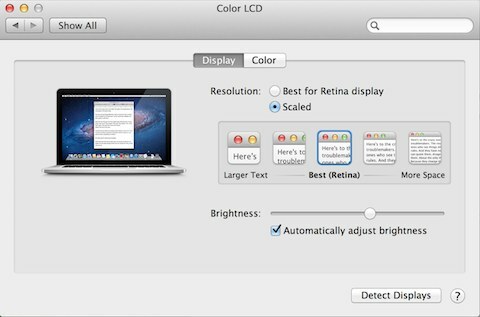 Choosing one of the five options automatically adjusts the resolution of the display for you. Although the resolution changes, it never shows you what resolution the computer is running in. Like most of Apple’s software and hardware, this way of choosing a resolution will probably appeal to a lot more people because it’s not just numbers, but a visual choice. I found the best choice for me was the default setting “Best for Retina display.” That’s probably where I’ll leave it for now. I tried to get the MacBook Pro to get hot enough to turn the fans on, but after a few hours of using it, the fans have still not turned on. Or if they have, I haven’t been able to hear them. I’ve been doing regular work on the Retina MacBook so far like image editing, writing, email and browsing the Web. I used it on the desk and on my lap and there is no heat coming from the notebook at all. It seems to be a lot like the MacBook Air in that respect. The only thing that surprised me at first was the weight. I thought it was heavy, but that’s because I was using a 13-inch MacBook Air for months. After working with it for a little bit the weight wasn’t as noticeable — it’s just what you get used to. My Retina MacBook Pro has 8GB, 2.3GHz Intel Core i7 and a 250GB Flash disk. I still have a lot of things to do with MacBook Pro, but I’m really happy with it so far.